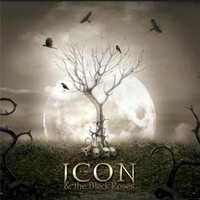 ICON & THE BLACK ROSES is Love Metal / Gothic Metal band from United Kingdom. It started in 1999 under the name of BLUE OBSESSION. The band recorded a demo called “4 Winter Songs”, a debut album in 2004, After splitting the group, they comeback to work on new album in 2011, and in 2013 they have relased CD „Thorn”. Every song from this CD is worth a listen. My number one is “Healing Touch”, with a catchy chorus and great atmosphere created with modern keys, gentle piano, commercial sounds and a passion of singing by singer. Memorable is also the energetic track “Wings of a Dreamer” with a choir of band. The singer's vocals remind me of VILLE VALO (HIM). Johnny Icon has wonderful voice and his voice, at moments, reminds me of JAMES HETFIELD (METALLICA) also. It is hear able, for example, in the faster, “The Painter”. The opening track “Lost”, with power inside, has very catchy refrain, and is easy to remember. Gothic melodies, deep singing with amazing keyboards played by Antonio Agate. Brilliant singing with piano open the ballad “Sometimes” and then the sounds grow with each sound to excellent Gothic riffs. “Silence is Everything” is a great song. With its refrain it will move the listener to the other side of the soul. Gentle piano and violins create perfect atmosphere. The rhythmic section is very good and there is fantastic cooperate with guitars working! Clear singing and massive guitars shows that the band cares about each sound! This album just charms me! Another energetic song “With or Without You” has everything what is needed in love metal climate songs; feelings flowing through lyrics and hard melodic guitars with gentle keys. Catchy refrain with a fantastic melodic voice and sounds with modern echoes in “Innocence” are just honey for your ears, soul & heart. In “Devil Made You” are hear able BON JOVI and NICKELBACK influences in more powerful version, and in “Moments of Madness” are many HIM echoes & memorable commercial sounds in Hard Rock style. ICON & THE BLACK ROSES plays Love Metal with Gothic Metal echoes and I think that HIM is their main influence. I'm sure everyone who loves such climates and melodic beauty connecting with hard sounds in music will love this album. Production on this CD is on high level. Listenable is also many experience of musicians. The choruses are very catchy and the melody is hear able in every sound. In their music, you can feel the guys playing with passion, and sincerity from their hearts. I'm impressed with the English Metallers' work and I'm charmed by the melodic vocals. Highly recommend!